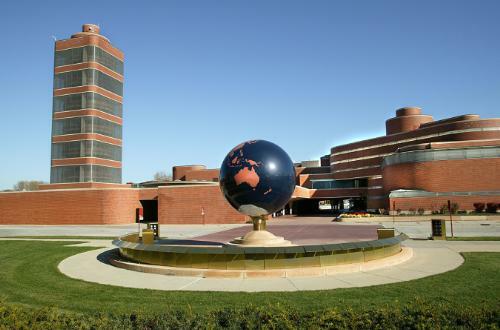 An unusually vertical Frank Lloyd Wright building in Wisconsin will open its doors to the public for the first time since its construction in 1950. The Research Tower in Racine, Wisconsin has housed SC Johnson for 32 years, anchoring its 153-foot tall mass with a distinctive “taproot” foundation. Its tree-like core and wrap-around windows will now be open to visitors, beginning on May 2. Tours will run on Fridays and Saturdays through September 27. SC Johnson’s Wright-designed corporate campus is a glimpse of what the architect’s ambitious urban planning vision might have looked like had it taken root beyond a few scattered examples such as the site of the 15-story Research Tower. That building, as well as the company’s 1939 Administration Building, are now on the National Register of Historic Places. The Museum of Modern Art in New York is mounting an exhibition on Wright’s radical approach to urbanism, which included seemingly contradictory bids for a sprawling “Broadacre City” and mile-high skyscrapers that pushed density to the brink of absurdity. The show is called Frank Lloyd Wright and the City: Density vs. Dispersal. Research Tower is not the only bit of Wright’s portfolio to see some sunshine lately. In December the architect’s first independent commission—the William Winslow House in River Forest, Illinois—went on the market. Weeks later the balcony over Wright’s studio in Oak Park announced it would open for public tours for the first time in decades.